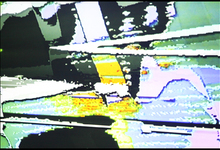 Botborg is an international audio-visual performance group that fuses and rewires raw electronic signals to create intensely visceral experiences of sound-color synaesthesia. Using a complex array of custom electronics, Botborg create totally live multi-sensory assaults of interdependent color and rhythm, pushing the limits of technology to invoke the maximum possible stimulation of their audience’s mind and body. Using the largest sound systems and projection screens available, Botborg provides a highly physical experience in concert as the combination of noise, light, and the live space erupt into a work abstracted beyond the cinematic language. Botborg has hosted live demonstrations at many prestigious music, film, and media festivals throughout Europe, North America, Australia, and Japan.